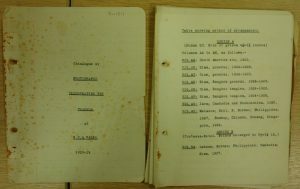 We are pleased to announce that the catalogue for the Papers of Horace Geoffrey Quaritch Wales is now available on Archives Hub. This has been a long term project due to the size of the collection and I am very grateful to two consecutive SOAS Alphawood Scholars, Pawinna Phetluan and Praphaphan Chuenkaek , for the work they put into organising and listing the collection, and commencing the catalogue. I completed the project earlier this month and so the scope of his Papers is now available to researchers everywhere in the world. Horace Geoffrey Quaritch Wales was born in 1900 and educated at Charterhouse, followed by Queen’s College Cambridge. In 1924 he entered the service of the Siamese government and from 1924-1928 acted as an adviser to King Rama VI and King Rama VII. This led to the publication of Siamese State Ceremonies (1931), and Ancient Siamese Government and Administration (1934), this volume being translated into Thai in the same year. He married, and with his wife, Dorothy, began extensive travel particularly in south and southeast Asia. During 1934-6 he served as field-director for the Greater India Research Committee, directing archaeological work on early Buddhist sites in Thailand. From 1937-1940 he and his wife undertook surveys and excavations in Malaya, particularly in the Kedah region. He published The Making of Greater India (1951) and continued to publish books, articles and reviews throughout his career. He died in 1981. These journals have burgundy and tan hard covers and are titled “Journal of Travel & Observation, H.G.Q. Wales Vol.I-II 1923-1928”, handwritten journals, including hand-drawn maps of the areas. They cover Quaritch Wales’ travels in South America and Southeast Asia in the period. 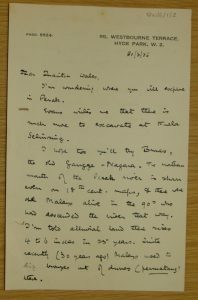 On the title page is written “These early writings are not for publication at any time”. 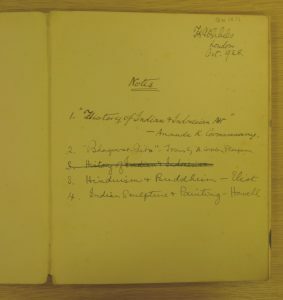 This is one of eight personal notebooks in the Papers covering a range of Quaritch Wales’ thoughts and research. The above page shows the index to this volume. 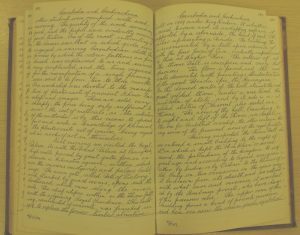 Below is some of his notes on Burma from inside the book. Above is the earliest item we have of Quaritch Wales’ possessions. 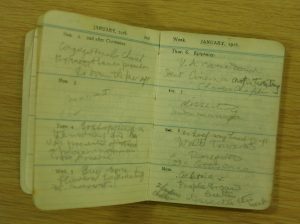 It is his diary for 1914 when he was a pupil at Charterhouse. It appears that Quaritch Wales was a highly organised individual. Above is his catalogue for the photographs he had taken between 1923-1929. This is extremely useful in sorting the photographs that were also bequeathed to us. 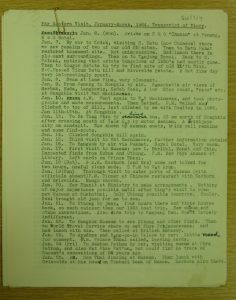 Below is one of 36 travel itineraries for holidays undertaken by Quaritch Wales and his wife, Dorothy, between 1961 and 1980. QW/7/7 – Far Eastern Visit, January-March 1964. This letter explores the possibilities of archaeological excavations in the Perak area, Malaysia. 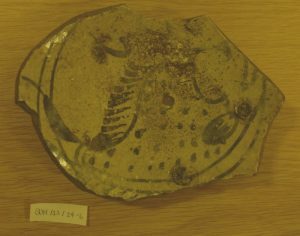 Some small items from his excavations have also become part of the Collections, Some are marked with initials indicating the possible sites at which they were found. Others, like the one below, are unlabelled and therefore it is difficult to establish their provenance. Several items of furniture were also bequeathed to the Society. Some of these unfortunately had to be sold when we moved premises to our current site. 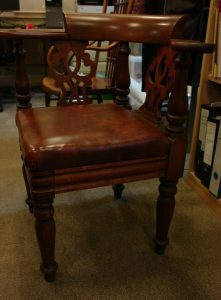 However some remain, including this handsome George III mahogany corner armchair, circa 1770, which is housed in our office and still offers a resting spot to many visitors. We also have a large collection of photographs, slides and glass slides. These are still in the process of being sorted. Much of the background work of organising, repackaging and listing has been completed, but as yet, they have not been catalogued. We hope that in this coming year that may be completed, so that this wealth of material on south-east Asia will become better known to researchers. The Papers of Alexander Gerard (1792-1839) – an East India Company soldier, surveyor, and explorer of the Himalayan region. The Papers of Benjamin Heyne (d.1819) – a botanist, part of the Mysore Survey team. 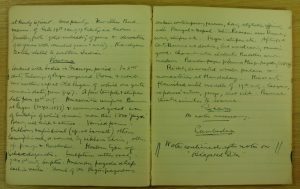 The Royal Asiatic Society Research Registration Records – part of our institutional records. It is, of course, a continuing project to get more of our archives sorted and catalogued on to Archives Hub, but it is a delight to know some more have been added and therefore the items they list can be more easily discovered by researchers.